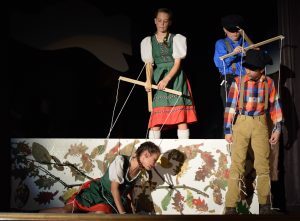 In the fall of each year, the Middle School produces a play for the entire school including parents. Participation is by audition only. Non-acting positions are also open for students interested in stage crew, lighting, props, etc. Past productions have included Suessical Jr, Hansel and Gretel, Alice in Wonderland Jr. and The Best Christmas Pageant Ever. Each spring the High School produces a play or musical (these are usually rotated each year). This is by audition only and many non-acting positions are available. Past drama productions include A Family Reunion to Die For, Get Smart, Treasure Island, Arsenic and Old Lace and last year Over the River and Through the Woods. On rotating years, with the High School play, a musical is produced combining the talents of both the High School and Middle School students. This is open by singing audition only. Since this is usually performed with an orchestra, advanced MCCS instrumentalists can perform with the professional musicians if qualified. Many non-acting positions are also available to interested students. Past musicals include Cinderella, Fiddler on the Roof, Into the Woods Jr., Little Women, and Annie. *Participation for all of the above including the bands is available to cyber and home school students. Please contact the school for participation requirements.